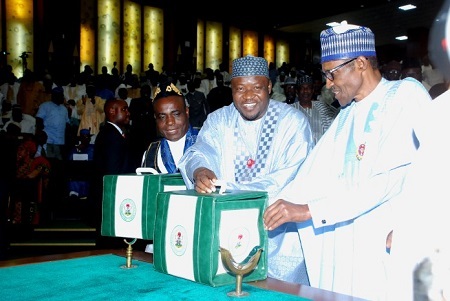 National Assembly releases new date for passage of 2018 budget – Royal Times of Nigeria. A lawmaker in the National Assembly, Rep. Zakari Mohammed who is the Chairman, House of Representatives Committee on Education has revealed that the 2018 budget will be passed into law by end of April. Mohammed told newsmen in Ogbomoso on the sideline of an empowerment programme organised by Rep. Segun Ogunwuyi (APC-Ogbomoso North/South/Oriire) for his constituents. The News Agency of Nigeria (NAN) reports that Ogunwuyi had through the programme empowered 827 beneficiaries, including various associations and traditional rulers. Mohammed, who represented the Speaker, Mr Yakubu Dogara, at the event, stated that the delay in passing the budget was due to lack of cooperation from some ministers. He said, “When a budget is laid, it is our duty to ask for detail information because we won’t manufacture figures. That is the problem. I am sure that by the end of April we will have a budget,’’.